Ask Splitsuit - November 2011. This is a big Q&A page where SplitSuit answered a bunch of different questions from visitors to ThePokerBank. It's a bit like a mini "well" thread as found on 2p2. You can see the original question form here (the form is now closed). Welcome to my upteenth attempt at writing a biography. I should preface this by saying that I hate writing about myself as I don't enjoy braggadocios writing styles in general. But, because Greg asked me so nicely, I figured it was worth a shot. And with that, let's get started! My name is James Sweeney and I have about 28 different online aliases. My most popular ones are “SplitSuit” and “*Split*”, always with capitalization on the “S”. When I got started on 2p2 I chose the username SplitSuit because I was playing PLO8 back then, and split suit hands (hands with 2 different flush potentials) were strong and I thought it was a cool name. After a while I started my website, www.SplitSuit.com, and 2p2 told me I had to change my username because of it. From there on out I have been known as *Split* (which I was kind of used to being called by students and such anyway). I was born in a suburb outside of Chicago, IL and moved to a Boston suburb in the middle of high school. After graduation I went to Syracuse University and did my 4 years there to get my BS in marketing. It was at Syracuse that I began to get into poker. In fact, most of my college friends were made in our original home games/SNGs that we started running the first week of school. I would say I was a pretty standard beginning poker player...I thought I was pretty solid and awesome even though I couldn't reason out a line to save my life lol. I originally started playing poker online my freshman year, doing the cliché “put $50 on and grind it up”. However, I wasn't doing the grinding up aspect of that very well. I would go play $22 SNGs, or 25NL cash and would usually get my account right back to $0 within an hour or so. I got sick of this pretty quickly, and after watching one of my friends constantly get deep in some decent MTTs I decided that I was going to take the game more seriously and study, discuss, and read everything that I possibly could. I started improving pretty quickly, and had a real knack for being able to “feel” out situations in live games. I grew a bankroll from $1K to $15K pretty quickly just playing some 200NL and 500NL live games at Turning Stone (which was about 25 minutes too close to my dorm for me to do well in college, lol). I was also starting to put together some SNG results online (but to be fair, who DIDN'T murder Party Poker SNGs? ), and was really building some knowledge and confidence. However, it was about this time that I started dabbling in the pits. Playing lots of blackjack and let-it-ride before and after live sessions, and then occasionally skipping poker all together to play craps. That eventually turned into sports betting as well...and before you know it I had pitched about half of my poker winnings back (luckily for me I had been building my poker bankroll the whole time playing SNGs and PLO8 cash games). So in my sophomore year or college I decided that I would take everything off-line, quit poker and gambling cold turkey...and just do something else with my life. Fast forward about 3 months, after watching all of my friends just print money playing the Bodog nightlies, Party cash games, and every game in between...I realized I was gapping too much value by quitting poker. I decided I was going to get started again but totally resist any sort of -EV gambling. From there it was just a grind. Playing lots of PLO8 cash, then getting back to my SNG roots, then dabbling in some MTTs with moderate success. My friend at the time was crushing everything from HULHE to HUNLHE SNGs to 6max NL cash and convinced me to give it a whirl. I started playing the old FTP deep cash games ($.15/$.30, $60 max buy-in) and just murdered them. The games were so soft, and while not all of my PLO8 skills transferred over...things like bet sizing and pot geometry just allowed me to adjust quickly. From there I moved up until about 100NL 6max, where I was having some issues and decided to jump over to 100NL FR because I heard FR was getting more popular and the games were easier. At that point I pretty much grew into the player I am now. Constantly growing, adjusting, and rethinking entire strategic functions. I took my first FR student back in late 2007 (a player who is actually on the DC coaching roster), and loved coaching so much that I started doing a lot of it. I eventually got my first video making gig at Stox in 2008, and was moved over to CardRunners in 2009. I also started experimenting with various coaching mediums, between videos and tanks and 1-on-1 sessions and protege programs. 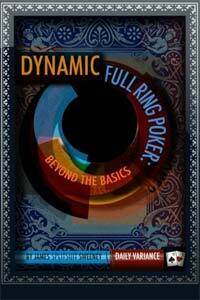 And all of that finally culminated with my first book Dynamic Full Ring Poker: Beyond The Basics which was released in late 2010. Don't ever date a bi-polar girl while trying to grind professionally or semi-professionally. Seriously. Find a balance. Don't become overly consumed with any one thing in life. Vegas is awesome. I suggest every player spend at least one summer out here. Love money, but don't let it know that you love it. I have “luckbox” tattooed on my right shoulder. Although it is written in Irish, so you would never know what it said unless I told you. I played PLO/PLO8 with Hellmuth once. He was a really nice guy, though I suppose that is expected when you have AAxx every other hand and smash top set + as well.